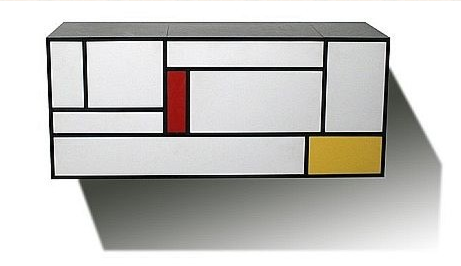 If It's Hip, It's Here (Archives): Mondrian Madness: In Furniture, Shoes, Home Decor & More. 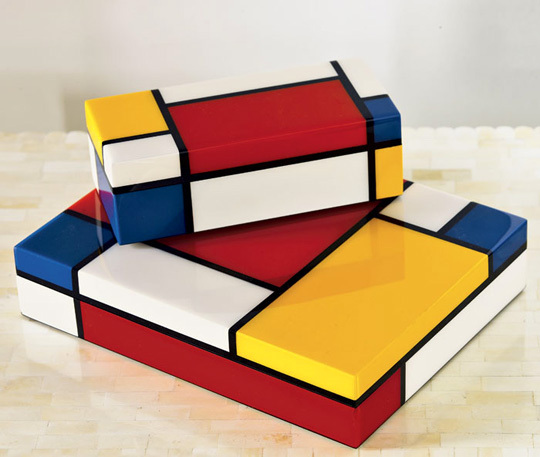 Mondrian Madness: In Furniture, Shoes, Home Decor & More. 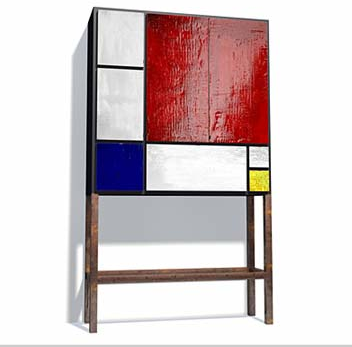 Dutch painter Piet Mondrian has been inspiring designers for many years with his later paintings from his De Stijl genre and it doesn't seem to be slowing down. 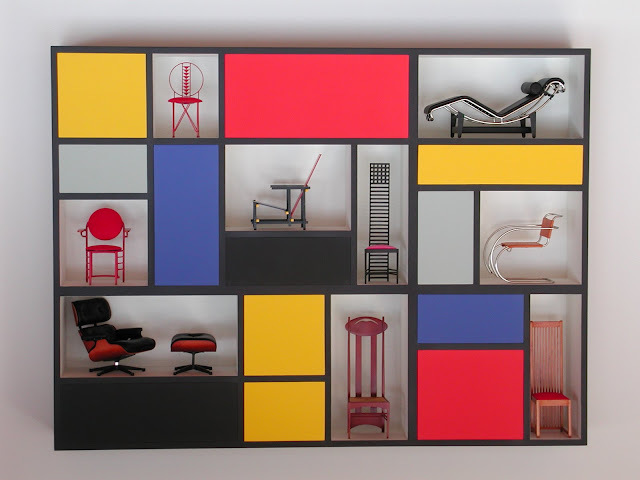 He painted a lot more than his most famous compositions of geometric grids incorporating primary colors red, blue and yellow (with white and black) but today I want to show you the incredible number of items that play off those particular pieces. 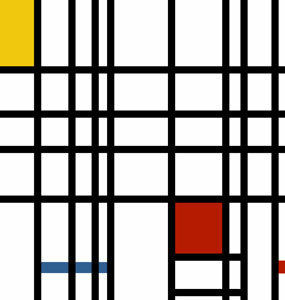 above: Piet Mondrian, Composition with Yellow, Blue, and Red, 1921, Tate Gallery. London. 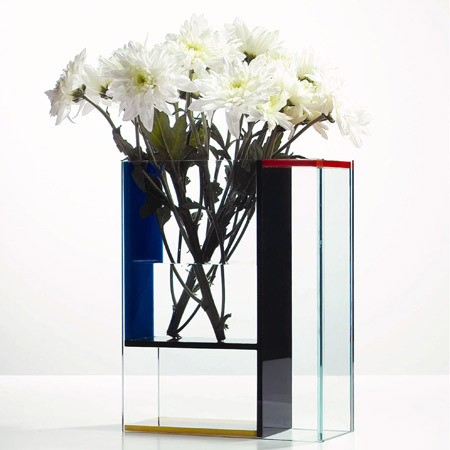 And now the homage to those paintings by designers of all types, with products of all sorts. 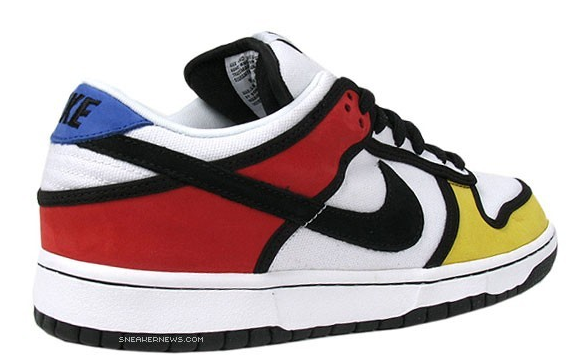 above: Nike just released these Piet Mondrian SB Dunks last May. 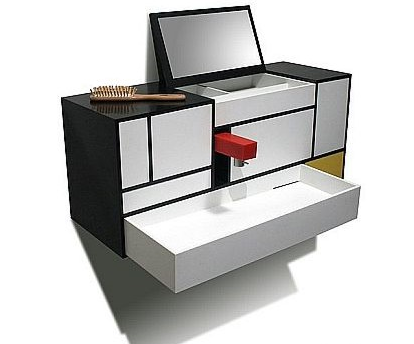 above: the Piet bathroom cabinet by rqr.estudio was a finalist in the 2004 Cevisama show, but unfortunately has not been mass-produced. 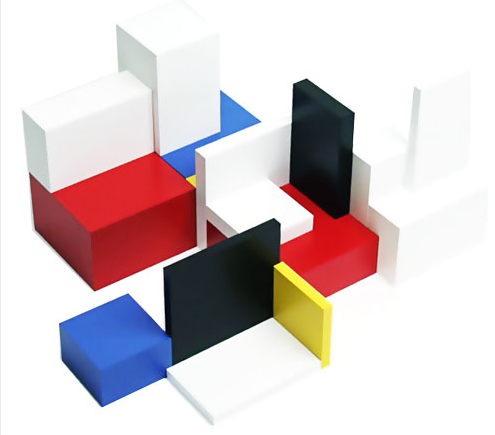 above: Naef Modulon Blocks are clearly inspired by Piet. 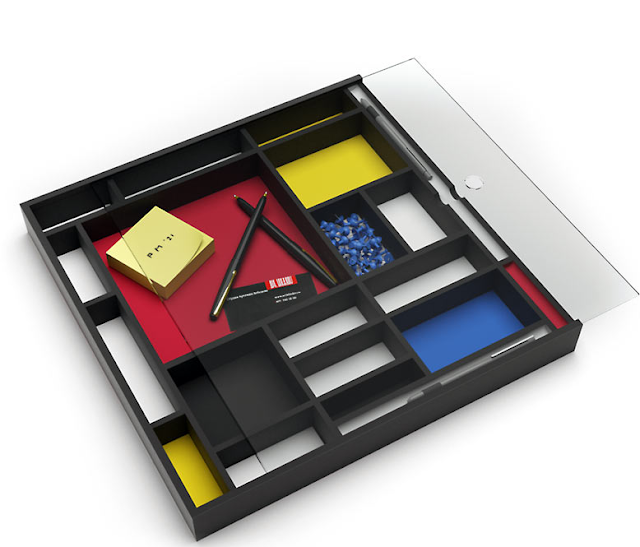 above: The Mondrianum is a tabletop storage box designed as a project by Dmitry Grigoriev for Art.lebedev studios. 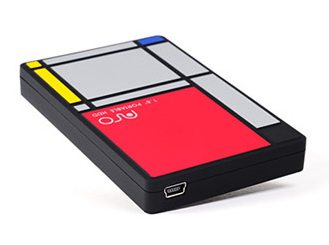 Even technology has gone Mondrian-a. 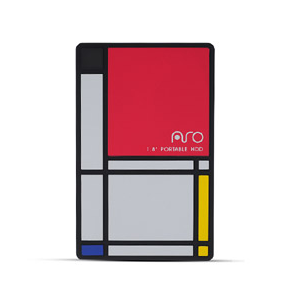 Korean Media Systems has released the ARO, a 1.8-inch portable hard drive. 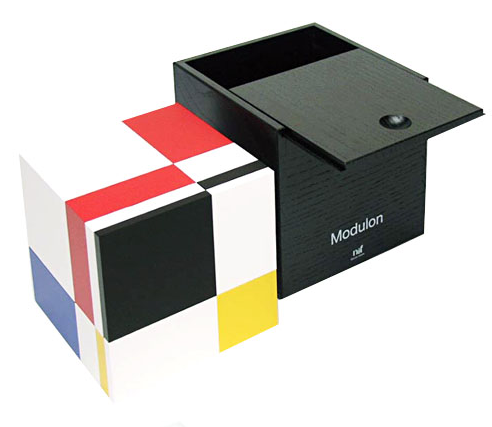 Best known for its mobility and low power consumption, it features a built in Mondrian design, plug-and-play operation, SF-coating stability and LED indicator, USB 2.0 (480 Mbps). Available in 60g, 80g or 100g. 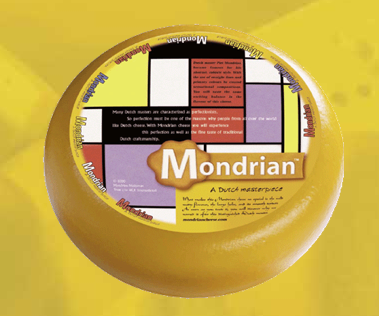 above: There's even Mondrian Cheese, see it here. 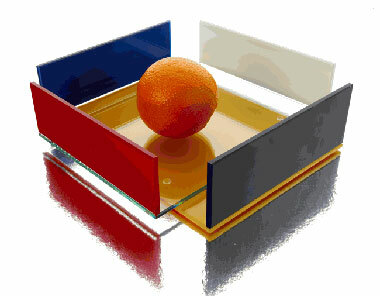 Piet Mondrian was born Pieter Cornelis Mondriaan, Jr., on March 7, 1872, in Amersfoort, the Netherlands. He studied at the Rijksakademie van Beeldende Kunsten, Amsterdam, from 1892 to 1897. Until 1908, when he began to take annual trips to Domburg in Zeeland, Mondrian’s work was naturalistic—incorporating successive on influences of academic landscape and still-life painting, Dutch Impressionism [more], and Symbolism [more]. In 1909 a major exhibition of his work (with that of Jan Sluijters and Cornelis Spoor) was held at the Stedelijk Museum, Amsterdam, and that same year he joined the Theosophic Society. In 1909 and 1910 he experimented with Pointillism and by 1911 had begun to work in a Cubist mode. After seeing original Cubist works by Georges Braque and Pablo Picasso at the first Moderne Kunstkring exhibition in 1911 in Amsterdam, Mondrian decided to move to Paris. There, from 1912 to 1914, he began to develop an independent abstract style. Mondrian was visiting the Netherlands when World War I broke out and prevented his return to Paris. During the war years in Holland, he further reduced his colors and geometric shapes and formulated his nonobjective Neoplastic style. 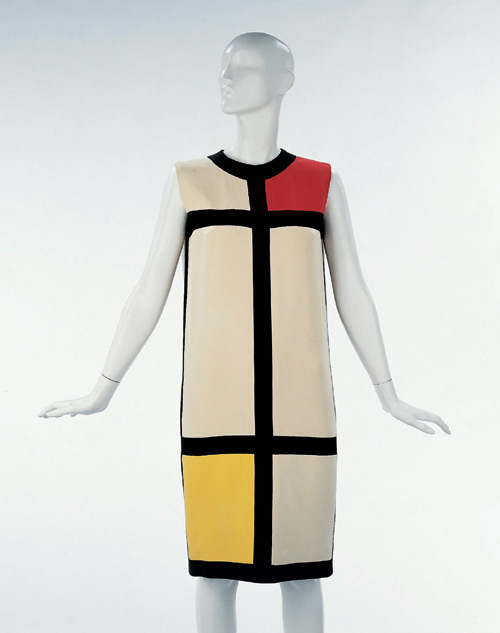 In 1917 Mondrian became one of the founders of De Stijl [more]. 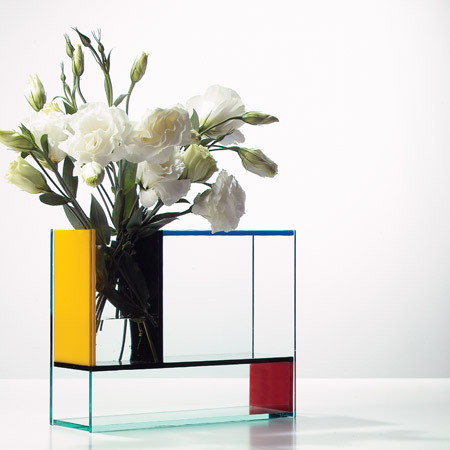 This group, which included Theo van Doesburg, Bart van der Leck, and Georges Vantongerloo, extended its principles of abstraction and simplification beyond painting and sculpture to architecture and graphic and industrial design. 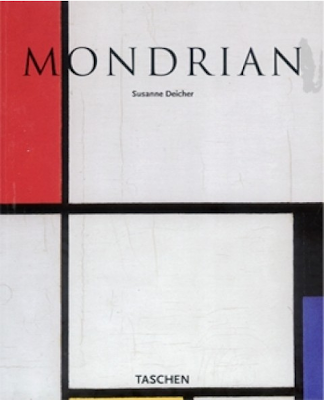 Mondrian’s essays on abstract art were published in the periodical De Stijl. 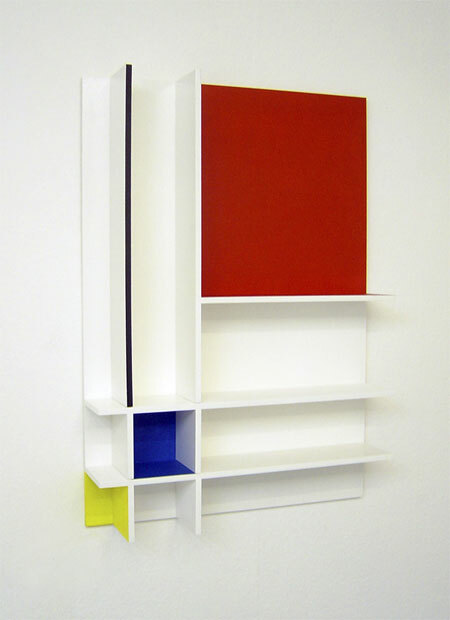 In July 1919 he returned to Paris; there he exhibited with De Stijl in 1923, but withdrew from the group after van Doesburg reintroduced diagonal elements into his work around 1925. 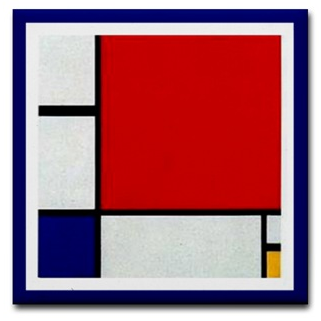 In 1930, Mondrian showed with Cercle et Carré (Circle and Square) and in 1931 joined Abstraction-Création. 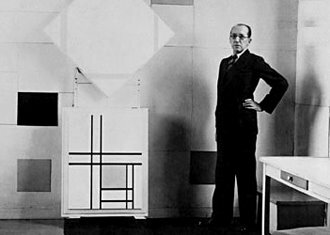 World War II forced Mondrian to move to London in 1938 and then to settle in New York in October 1940. In New York he joined American Abstract Artists and continued to publish texts on Neoplasticism. 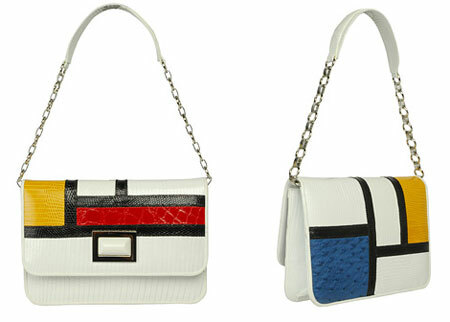 His late style evolved significantly in response to the city. 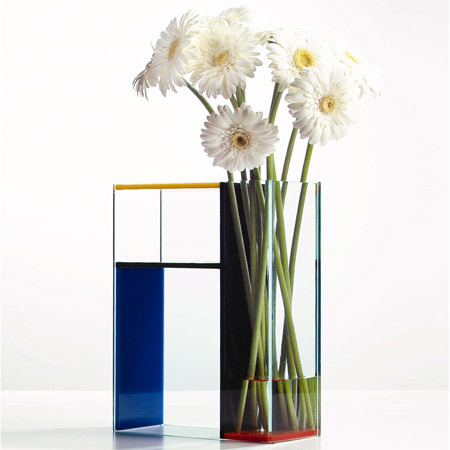 In 1942 his first solo show took place at the Valentine Dudensing Gallery, New York. 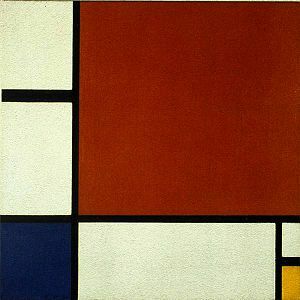 Mondrian died February 1, 1944, in New York. 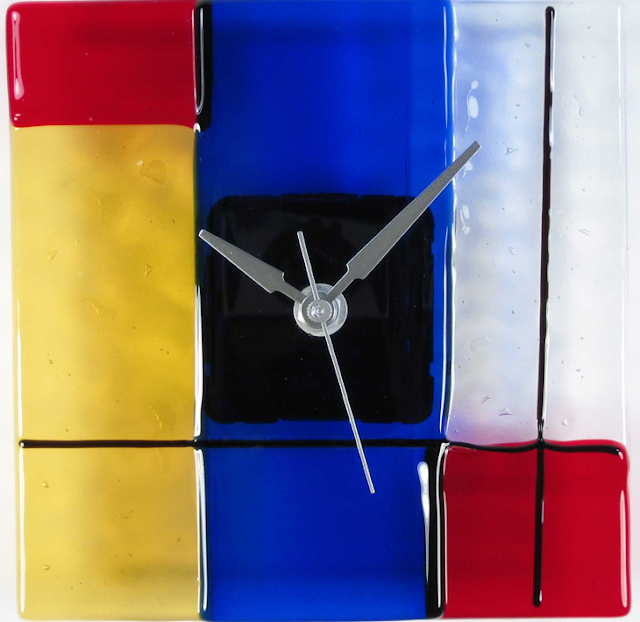 A site where there's a large collection of Mondrian artifacts, works of art and more. 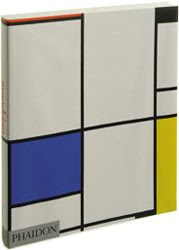 Buy Mondrian Books, gifts and more here. 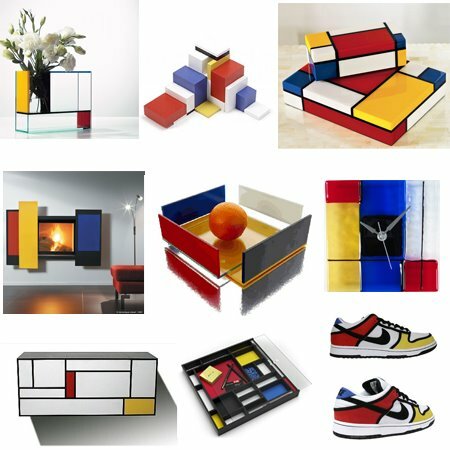 I continually add to my list of Mondrian inspired items here, it ill be more recently updated than this post, so be sure to check it out! Love this roundup - thank you for gathering up this great collection! 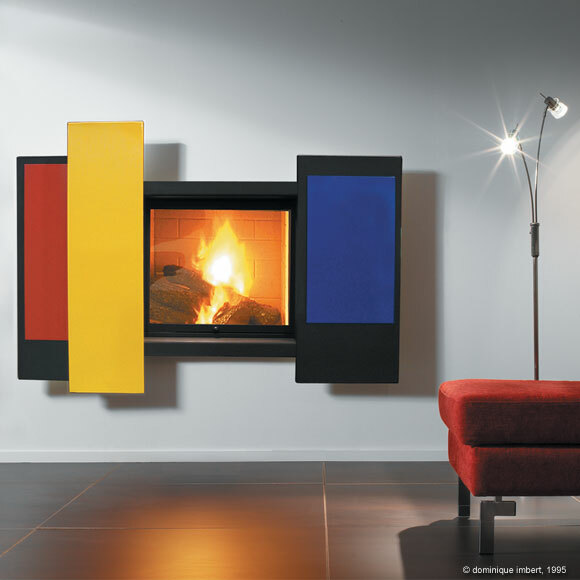 Mondrian was a member of the De Stijl movement. It wasn't "his." 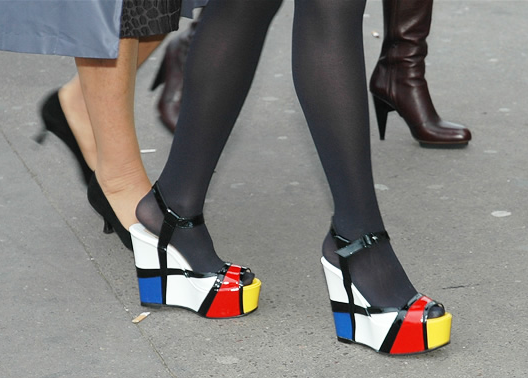 i am soooo obsessed with the christian louboutin mondrian wedgesss.. mann i've been looking EVERYWHERE. do you know of any place to purchase them? If I didn't put a link as to where they can be purchased, it means they are either no longer available for purchase or I could not locate where you can buy them. 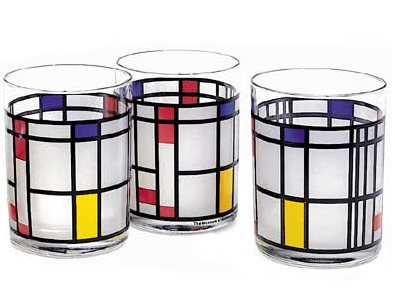 very nice collection of mondrian items. 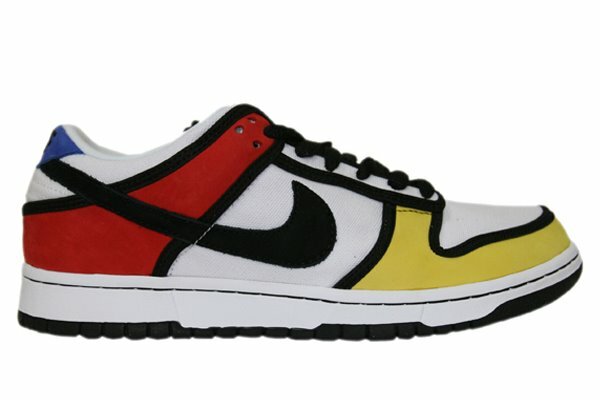 i acutally noticed jamie kennedy wearing a pair of mondrian inspired cycling gloves in his movie 'kickin it old school'. has anyone else seen these or know where they can be found? thanks. By the way, I have just created my own furniture blog and I would like to do a link exchange with you. If you are interested, email me @ lukeberg@gmail.com. Hi! 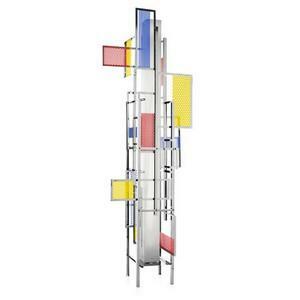 Thanks for the information on Piet Mondrian. 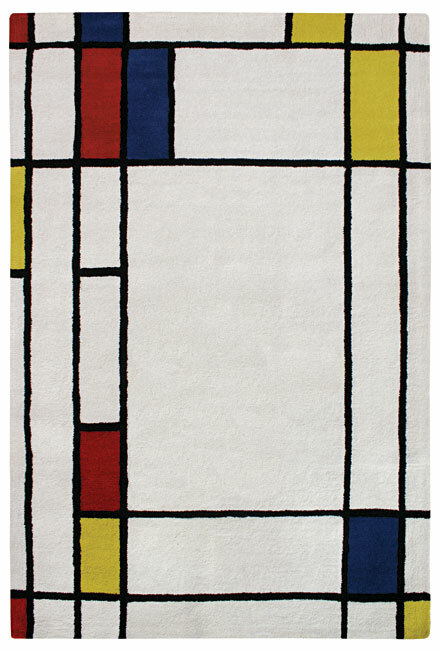 I am looking for a Piet Mondrian shower curtain... do you know where I might find one? jfarmer47@hotmail.com. Thanks! Awesome post.very nice.very thanks for sharing.you are so cool. 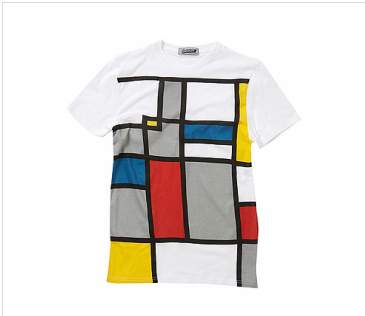 I've been looking for some Mondrian gloves... Do you know where I can find those? Ah.. now that's a challenge! You'll have me cruising the web for weeks. But I'll try to find some! Andrea, what a very nice thing to say. Thanks so much! You not going to believe this but I have lost all day searching for some articles about this. I wish I knew of this site earlier, it was a fantastic read and really helped me out. Have a good one.